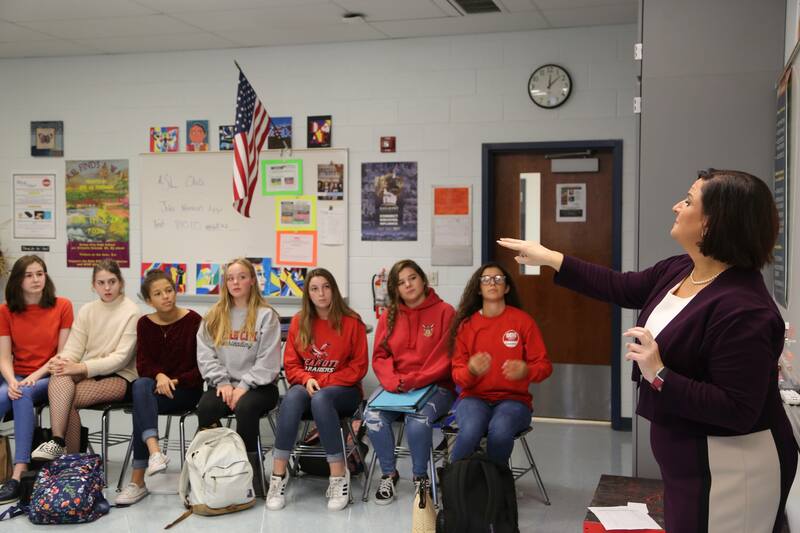 Most people would consider themselves lucky if they had one passion in life, but for Ocean City High School teacher Amy Andersen, her life has been guided by three powerful forces: music, sign language and her family. Andersen, an only child who grew up in Cape May Court House, the child of two educators, discovered music at an early age. As a student in Middle Township Public Schools, she began taking flute lessons in fourth grade. The interest soon consumed her and required great sacrifices from her parents. For a decade, she and her father made the more than one-hour drive into Philadelphia every Saturday morning so that she could take lessons with a private instructor. Those lessons paid off. As a sophomore in high school, Andersen was selected as the first chair and invited to travel to Russia as part of the Trenton Sister Cities Youth Orchestra. Andersen was accepted into Indiana University’s prestigious orchestra program, an intense commitment that meant four hours of rehearsal a day, and that left no room for extra-curricular activities or outside interests. But another interest lingered. When she was seven years old, Andersen’s mother, Ruth, was working as a teacher’s aide with a severely cognitively impaired and deaf student. Gina Lanza, an educator fluent in American Sign Language (ASL), taught Andersen’s mother how to communicate with her student, and Andersen tagged along to the lessons. On school breaks while back in New Jersey, Andersen substituted at the Cape May County Special Services School District where she was mentored by people such as Kathy Fillipo, a teacher of the deaf. Through a scheduling quirk, Andersen took ASL-1 and ASL-3 but had to double-up on ASL-2 and 4 in order to not miss anything. She put her new skills into practice by working as an interpreter for a student who had lupus and was losing her hearing. She would attend classes with her and sign the lessons. At the same time, Andersen continued to pursue a career as a professional musician. She was accepted to graduate school at Temple University to continue her music education, but the gratification of working with deaf students was so much greater than her desire to perform that she struggled to reimagine her goals. Anderson and her parents had sacrificed so much to make a career in music possible that it was challenging for them to accept that music was no longer the most important passion in her life. Andersen spent a great deal of time with other ASL students. Finally, one night while out signing with students, she admitted that she wanted to be a teacher of the deaf. Andersen’s parents quickly became very supportive and encouraging. Andersen applied, and was accepted to a program in Western Maryland that focused on a bilingual, bicultural approach to signing. When she discovered that hearing students did not have to be fluent in ASL in order to be accepted into the program, a double standard that she felt weakened the program and insulted the deaf students, Andersen worked with other students to ensure that hearing students admitted to the program had some background in ASL. She completed 250 hours in a practicum at the Maryland School for the Deaf and accepted an internship at the Learning Center in Framingham, Massachusetts. When her cooperating teacher went on maternity leave, she was offered the position. That led to a full-time position the following year. 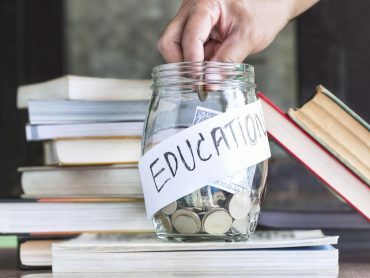 Andersen stayed for three years, but with a master’s degree and 30 credits, she was making only $21,000 a year at the private school. Reluctantly, she had to move on, and she found a new home in the Boston Public Schools. 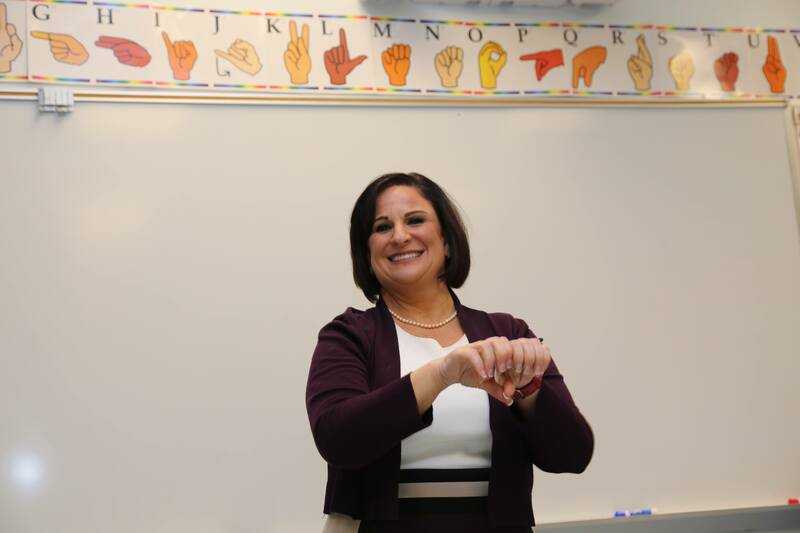 Nationally, the Horace Mann School for the Deaf enjoys one of the best reputations for deaf education. The principal, Patrice DiNatale, was a mentor for Andersen. She encouraged Andersen to take on new challenges. One of the greatest challenges was the discrepancy among the kind of support families could provide to Andersen’s students. Some had been born into deaf families with a strong support system. Some were hearing immigrants who were struggling to acquire the necessities for their families. By 2004, Andersen was married and had a baby, Jordan, when her third, and perhaps strongest, passion pulled her back to southern New Jersey: family. 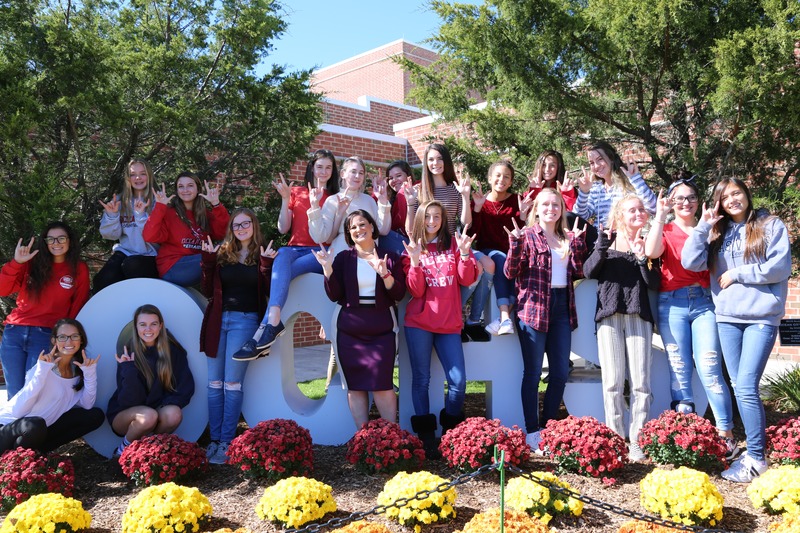 While Andersen had been thinking of moving closer to her parents, her mother provided an irresistible nudge when she sent Andersen a job listing for an ASL teacher at Ocean City High School. “I really loved teaching deaf students, but there were no deaf programs in the area and I wanted to be close to my parents,” Andersen said. Andersen was hired to teach in the special education department at Ocean City High School. She was working with one deaf student, providing support. A board member wanted an ASL class, so Andersen launched a program in 2004. 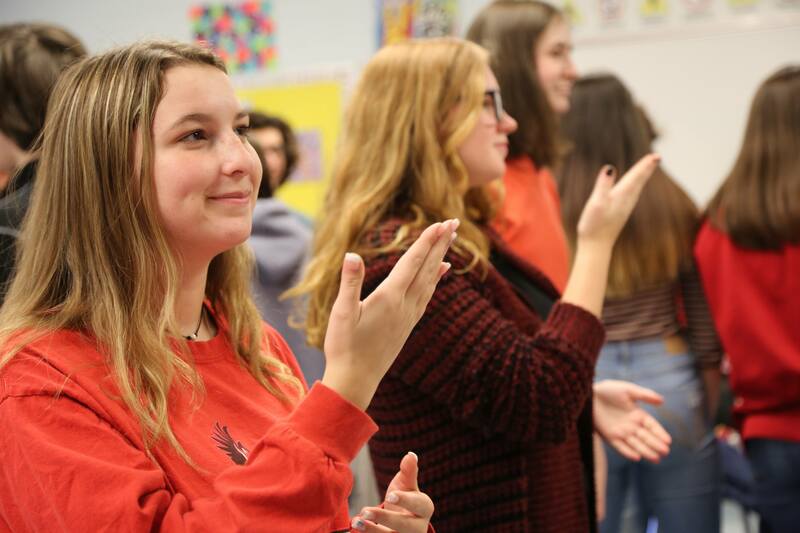 In one year, the ASL program jumped from 42 students to 138; the program now has six classes, three levels, and there’s a waiting list to get in. “My belief system is there should be a deaf person teaching ASL because it’s their language and culture,” Andersen said. 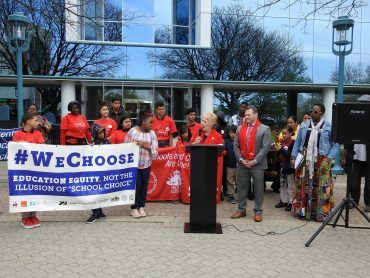 “But since the process for teacher certification involves 30 credits of ASL at the college level, someone who grew up signing wouldn’t naturally take ASL 1, 2 and so on, so it creates an obstacle for some deaf would-be educators.” In addition, since southern New Jersey does not have a large deaf community, there are not enough certified people to meet the demand. As the New Jersey State Teacher of the Year, Andersen will spend a six-month sabbatical, courtesy of ETS, working with the New Jersey Department of Education. Her goal is to get more deaf teachers at the high school level, and mirror the bilingual/bicultural model she used as a teacher of the deaf. Andersen believes that with both hearing and deaf teachers in a program, students will see how differences connect people and that they are stronger because of diversity, not in spite of it. “Deaf culture is a minority culture with a minority language in a majority culture,” Andersen said. 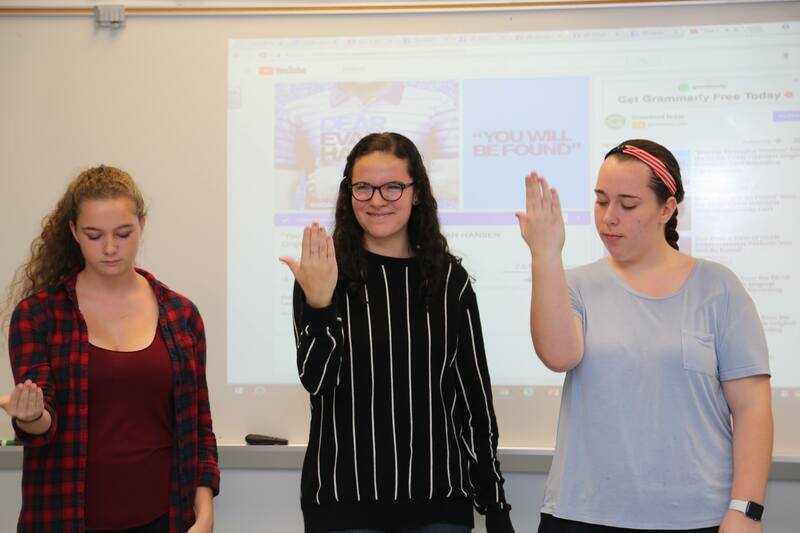 “Because of ASL, we are able to talk about respecting differences and learn about cultures, and that carries over from the deaf community into the things that these high school students are dealing with every day. For Andersen, her sons, Jordan and Jacob, and her parents, Michael and Ruth, this will be a year of new opportunities and experiences, but the ability to combine her three passions will undoubtedly bring her back to Ocean City High School and the connections she is working to build there among ASL-educated students and the deaf community. In addition to the six-month sabbatical, ETS supplies the teacher of the year with a laptop. 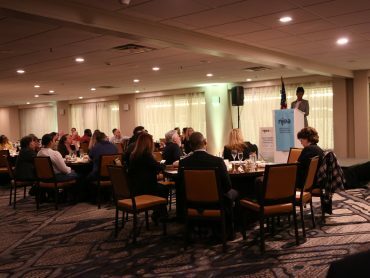 NJEA will provide Andersen with a car lease for the year equipped with EZ Pass, a $500 clothing allowance, media training and communications support, and funding for the trip to Washington, D.C. to meet the president, along with other state teachers of the year. She also has free access to all NJEA statewide trainings. At the end of the year, NJEA will present Andersen with a ring to commemorate her achievement. • Promoting an environment that supports vision as the primary sense used for communication at school, in the home, and in the community, as vision offers individuals who are deaf access to information about the world and the independence to drive, travel, work, and participate in every aspect of society. • Valuing children who are deaf as the future of deaf people and deaf culture. Deaf culture therefore encourages the use of ASL, in addition to any other communication modalities the child may have. • Support for bilingual ASL/English education of children who are deaf so they are competent in both languages. • Inclusion of specific rules of behavior in communication in addition to the conventional rules of turn taking. For example, consistent eye contact and visual attention during a conversation is expected. In addition, a person using sign language has the floor during a conversation until he or she provides a visual indicator (pause, facial expression, etc.) that he or she is finished. • Perpetuation of deaf culture through a variety of traditions, including films, folklore, literature, athletics, poetry, celebrations, clubs, organizations, theaters, and school reunions. Deaf culture also includes some of its own “music” and poetry as well as dance. • Inclusion of unique strategies for gaining a person’s attention such as gently tapping a person on the shoulder if he or she is not within the line of sight, waving if the person is within the line of sight, or flicking a light switch a few times to gain the attention of a group of people in a room.